Development began in the early 1970s to replace the Alouette II, and the first flight took place on 27 June, 1974. 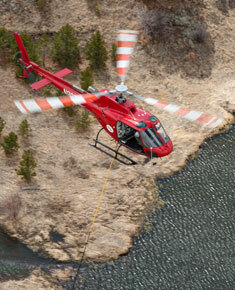 The latest version of the AS350 B3 is a member of Eurocopter's rugged and proven Ecureuil (Squirrel/AStar) range. All told, some 4,000 Ecureuils (incl. 726 twins) have flown over 17 million hours, in 91 countries, for some 1,600 operators. The B3 is the sum of that experience. With this latest version of the single-engine Ecureuil, Eurocopter offers operators more power, greater payload capacity over a broader temperature/altitude envelope, an augmented sling load capability, and higher cruise speed. The powerful Arriel 2B1 engine offers state-of-the-art technology, with single-crystal turbine blades and a single power stage, for outstanding reliability and simplified maintenance. 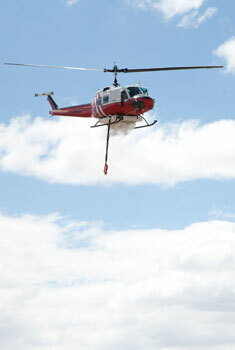 On May 14, 2005 an AS350 B3 piloted by Eurocopter test pilot Didier Delsalle touched down on the top of Mt. Everest, at 8,850 metres (29,035 feet). This record has been confirmed by the Fédération Aéronautique Internationale. On April 29, 2010 a stripped-down AS350 B3 succeeded in rescuing three alpinists from Annapurna, Nepal at 7,100 m (23,2939 feet), one at a time, the highest such rescue. While earlier "short-body" Hueys were a success, the Army wanted a version that could carry more troops. Bell's solution was to stretch the HU-1B fuselage by 41 in (104 cm) and use the extra space to fit four seats next to the transmission, facing out. Seating capacity increased to 15, including crew. The enlarged cabin could also accommodate six stretchers and a medic, two more than the earlier models. In place of the earlier model's sliding side doors with a single window, larger doors with two windows were fitted, along with a small hinged panel with an optional window, thereby providing access to the cabin. The doors and hinged panels were quickly removable, allowing the Huey to be flown in a "doors off" configuration. The Model 205 prototype flew on 16 August 1961. Seven pre-production/prototype aircraft had been delivered for testing at Edwards AFB starting in March 1961. The 205 was initially equipped with a 44-foot (13.4 m) main rotor and a Lycoming T53-L-9 engine with 1,100 shp (820 kW). The rotor was lengthened to 48 feet (14.6 m) with a chord of 21 in (53 cm). The tailboom was also lengthened, in order to accommodate the longer rotor blades. Altogether, the modifications resulted in a gross weight capacity of 9,500 lb (4,309 kg). The Army ordered production of the 205 in 1963, produced with a T53-L-11 engine for its multi-fuel capability. The prototypes were designated as YUH-1D, and the production aircraft was designated as the UH-1D. In 1966, Bell installed the 1,400 shp (1,000 kW) Lycoming T53-L-13 engine to provide more power for the aircraft. The pitot tube was relocated from the nose to the roof of the cockpit, in order to prevent damage during landing. Production models in this configuration were designated as the UH-1H. The Bell 212 Twin Huey (also known as the Twin Two-Twelve) is a two-bladed, twin-engined, medium helicopter that first flew in 1968. 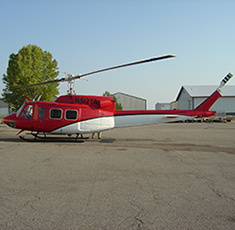 Originally manufactured by Bell Helicopter in Fort Worth, Texas, production was moved to Mirabel, Quebec, Canada in 1988, following suit with all Bell commercial helicopter production, which began to transition after the plant's opening in 1986. The 212's main rotor is powered by a Pratt & Whitney Canada PT6T-3 Twin-Pac, made up of two coupled PT6 power turbines driving a common gearbox. They are capable of producing up to 1,800 shp (1,342 kW). Should one engine fail, the remaining engine can deliver 900 shp (671 kW) for 30 minutes, or 765 shp (571 kW) continuously, enabling the 212 to maintain cruise performance at maximum weight.